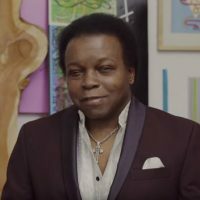 It rains love on 5 April this year with the release of Lee Fields’ next album and before that comes the fairly intense shower of affection that is his video for new soul slowie You’re What’s Needed In My Life. He’s on about his woman of course though I can’t imagine her taking any of that sass – she’s her own person – it is the twenty-first century! Oohh – he’s calling her ‘girl’ now too – she’ll have none of that either Lee – she’s all woman. Yes, you better ladle on the praise – and maybe give things time to settle by popping out to record the video. At a life drawing class. No, keep your clothes on, it’s not that kind of life drawing class. Yes, you can sing your song. I wonder who will do the best painting of you though? Beardy beanie hat man Michael? Beardy baseball hat man? Emo lycra girl? Long-hair lady 1? Long-hair lady 2? Yes! Emo lycra girl by a country mile! I knew it!